SILVERSPRING, Maryland -- Coral reefs suffered record losses as a consequence of high ocean temperatures in the tropical Atlantic and Caribbean in 2005 according to the most comprehensive documentation of basin-scale bleaching to date. Collaborators from 22 countries report that more than 80 percent of surveyed corals bleached and over 40 percent of the total surveyed died, making this the most severe bleaching event ever recorded in the basin. The study appears in PLoS ONE, an international, peer-reviewed, open-access, online publication. 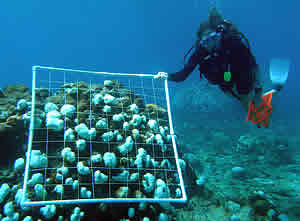 Satellite-based tools from NOAA's Coral Reef Watch Program guided site selection for field observations conducted across the greater Caribbean region from June to October 2005. Field surveys of bleaching and mortality in this study surpass prior efforts in both detail and extent. "Heat stress during the 2005 event exceeded any observed in the Caribbean in the prior 20 years, and regionally-averaged temperatures were the warmest in at least 150 years," said C. Mark Eakin, Ph.D., coordinator of NOAA's Coral Reef Watch Program. "This severe, widespread bleaching and mortality will undoubtedly have long-term consequences for reef ecosystems, and events like this are likely to become more common as the climate warms."